Amy's Creative Side: Featuring Chris -- A Blogger's Quilt Festival Quilter! Featuring Chris -- A Blogger's Quilt Festival Quilter! Our featured blogger today is Chris of izzy inspired ~ enjoy! 1.When did you begin quilting? I started quilting a little over 15 years ago now, when my first son was born. I was eager to make him a blanket (that's what I thought I was making back in the day) that he would treasure through his childhood. Shortly after, my first quilt was complete,  I was hooked from the start! I mainly quilt to give my children pieces of me to keep them warm and snuggly when I am not there, but also to give something to the future generations of my family that will link them to their heritage and to me. 3.What is your favorite quilting tip? My favorite quilting tip by far was given by one of my favorite bloggers, Cluck Cluck Sew. She gave the tip of using gardening gloves while quilting to keep her hands from slipping when trying to maneuver the quilt.....I have been quilting with gloves on ever since! 4.What was your inspiration for your QF quilt? The quilt that was in the QF was inspired by my daughter Isabella and her beautiful baby clothes. My sister and I started collecting baby dresses before I even got pregnant, and I couldn't resist putting them on my daughter from the moment she was born. To top it all off...she is extremely girly, and LOVES dresses. When she started growing out of them I instinctively packed them carefully away for the day that she would have a daughter of her own. As she got bigger and a bit more mobile, not all the dresses were in perfect condition for saving. That is when I decided that I wanted to make her a quilt with her too small dresses. I couldn't part with too many of them (cutting into them almost felt sinful), so I also used fabric from my scrap pile. As for the style of the quilt, that was a combo of my love of string quilts and patchwork. 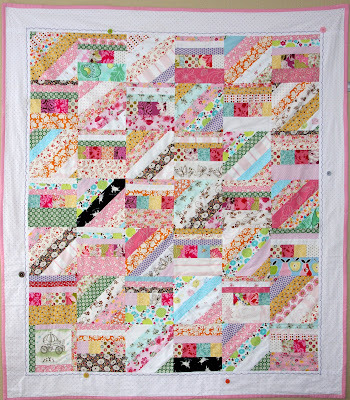 The blocks opposite of the string blocks were inspired by a wonderful blogger named Aneela, from Comfortstitching. 5.Do you sew other things? I do sew other little projects, but my main sewing passion is for quilting. Wow! I love the modern design in these! very nice quilts, thanks for sharing. Wow, GORGEOUS quilts! I love the idea of the baby clothes quilt! what a delightful read! thanks again for sharing such an inspirational blog. Great quilts. I love the one with Mendocino as well as the clothing one. Thanks for sharing. OOh love the quilts! Just my thing, in fact I also have an Aneela Inspired Heather Ross quilt top waiting to be hand quilted for my little girl! Am now going to try that dresden plate block, just love it!